I don't know if most people check their web site stats that often or not. Same goes for Google Webmaster Tools stats. I check them both fairly regularly. Mostly to see if there is anything that stands out as out of the ordinary and might require further investigating. 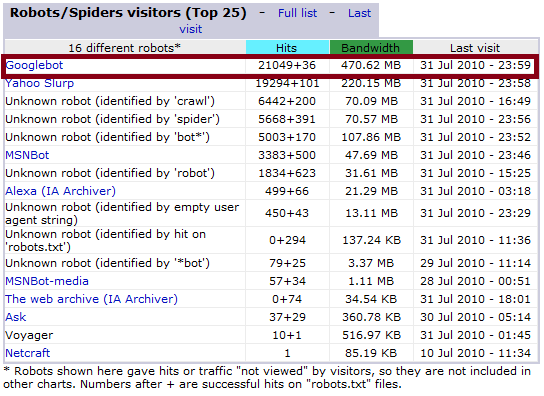 For some reason during the month of August the Googlebot Crawler seems to have got a little hungry or eager to crawl this site much more than usual. 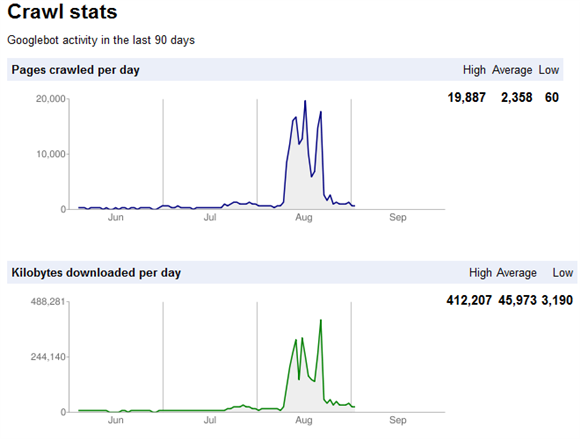 The month of August Google ended up hitting the site 176,061 times and consuming 3.15 GB's of bandwidth. Although it's not a real big deal it is quite a bit more than average for this site. 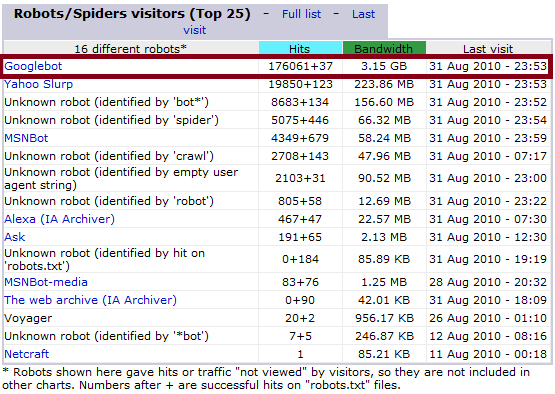 The month before in July Google hit the site 21,049 times and only 470.62 MB's of bandwidth. Which is generally more along the line of average or expected for this site. If I look in my Google Webmaster Tools account it is apparent that the Googlebot had 3 days of pretty heavy duty crawling (the 3 top most peaks). It also spent 2 days in between that were still fairly significant and above average (the 2 dips between the peaks). It seems to have dropped back to more normal levels now, but still slightly above July's crawl rate. I'm not complaining or anything. Whenever various crawlers come often it is usually a good thing. It is just a little strange to see it jump so much for a brief period of time. It might have been doing some deep crawling before a Google update. It will be something I will continue to watch during the current month of September now to see what happens.